Canada thistle infests more than one-million acres in North Dakota, recently surpassing leafy spurge as the state’s most prevalent noxious weed. Canada thistle is an aggressive, creeping perennial that infests cropland, pasture, rangeland, roadsides and non-crop areas. Since cattle typically will not graze near infestations, Canada thistle reduces forage production and consumption. Dakota West RC&D, in cooperation with the Stark County Weed Board, secured funding through the North Dakota Invasive Species Partnership to purchase and release the Canada Thistle Stem-Mining Weevil throughout ten counties of southwest ND and the Fort Berthold Indian Reservation. The Stem-Mining Weevil eats only Canada thistle and, as the name implies, the insect larvae bore into the plant and mine towards the main stem, crown and root, inhibiting the plant’s ability to produce seeds and grow roots. Testing in the U.S. and Canada indicate the root reserves of a plant attacked by the insect are reduced, this making the plant vulnerable to attach by other insects and disease. One adult female can lay 120 eggs in young shoots and about six larvae are needed in the shoots to effectively weaken the plant. Only private grazing lands were eligible and sites considered poorly suited for chemical control were prioritized. Similar to the establishment of the leafy spurge beetle many years ago, establishing colonies of the stem mining weevil is initially a costly proposition. As more viable weevil colonies become established, those colonies could one day serve as collection sites to increase distribution and at a lower cost. Enough Stem Mining Weevils were ordered to release on 160 sites throughout the project area. A Memorandum of Understanding was executed with each County Weed Board and the Three Affiliated Tribes to release the Weevils. Nort h Dakota experienced an unusually long, cold and snowy winter. Among the seemingly unending lists of property d estruction across the state were several lakes that experienced total or near total winter kill of fish. This is the saga that played out in Patterson Lake, a man-made reservoir on the Heart River just west of Dickinson, ND. When the ice-covered lake melted this spring, thousands of dead fish floated to the surface and lined the shores. Enter lake residents, who initiated a community clean-up of the lake on April 26 with the help of the media, dozens of area businesses and hundreds of community volunteers. The initial strategy was to collect the fish in plastic trash bags and transport them to City landfill. Conversation between Dakota West RC&D and area NRCS staff led them to approach the City of Dickinson, asking them to consider composting the fish. Staff agreed to the strategy but emphasized the plastic would need to be eliminated. Further conversations with organizers convinced them this would be a positive outcome from an otherwise unpleasant event and the wheels were set in motion. On Sunday, April 26, volunteers awoke to temperatures in the mid-30’s with mixed snow and rain. Nevertheless and in the true spirit of volunteerism, an estimated 300 individuals arrived on the scene to begin the arduous task. Volunteers used boats, pails, plastic totes, loaders, pitchforks, rakes and their hands to clear the lake. By 5:00 p.m., an estimated 75% of the lake was cleared. That evening and into the next day, sanitation staff hauled an estimated 150,000 fish (about 100 cubic yards) to the compost site. By 6:00 p.m. on April 27, the fish were sandwiched between a layer of wood chips and yard waste. As the smallest creatures on Earth actively fed on the former waste throughout the summer, it was processed into a valuable commodity. The success of this project prompted J.R. Flores, ND NRCS State Conservationist, to award the City of Dickinson Public Works Department a Cooperative Conservation Award. Jared Andrist, Dakota West RC&D Coordinator, presented the award on behalf of Mr. Flores at the May 18, 2009 Dickinson City Commission meeting. Local fishing and recreational hideaway Dickinson Dike received some much-nee ded shoreline improvement and repairs in late 2009. Areas of the shoreline, particularly the east side where public fishing access is provided, were eroding. The rock rip-rap had slumped, exposing the erosion blanket and subjecting it and the shoreline to degradation. Areas of the shoreline were literally washing into the small lake. With the blessing of the Dickinson Parks & Recreation department and a $3,000 contribution from Southwest Anglers Association, Dakota West RC&D secured $12,000 through the ND Game & Fish Department Save Our Lakes program to make the necessary repairs. Local contractor Stoppleworth & Sons, Inc. replaced the degraded erosion blanket and placed 112 cubic yards of rock rip-rap to stabilize the shoreline. Dakota West RC&D received funding through the Partners Internship Program to hire an i ntern for the summer of 2009. The Partners Internship Program (PIP) provides internship grants to nonprofit agencies in Minnesota, North Dakota and northwestern Wisconsin. Dakota West RC&D hired Kalsey Wenger, an undergraduate student attending Dickinson State University, as a summer intern to work with the Council. Ms. Wenger’s responsibilities included providing technical assistance to the Southwest ND Soil Health Demonstration project with the development of a marketing and outreach plan. Funding for the summer intern position was through the Partners Internship Program (PIP), sponsored through the Higher Education consortium for Urban Affairs. The POP seeks to advance the nonprofit sector and to benefit communities and students, and is funded by the Bremer Foundation. Ms. Wenger was employed with the Council from June through August 2009.
water-related issues, such as pollution and conservation. 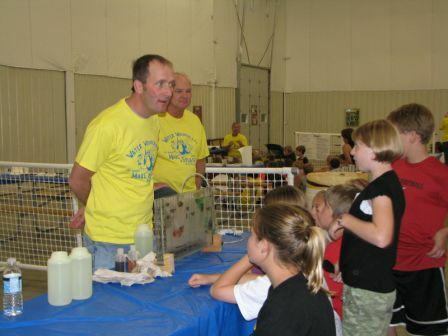 Expert presenters taught the different aspects of water and the important role it plays in our everyday life. 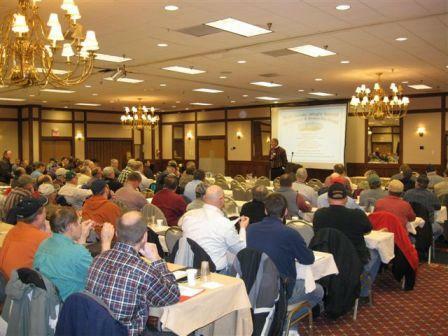 Dakota West RC&D was a co-sponsor of the 11th annual workshop presented by Central Stark and Western Soil Conservation Districts on January 8, 2007. Approximately 150 attendees were present. The agriculture forum is for regional agricultural producers. Topics covered in the forum included Pulse Crop Production Issues, US Farm Policy, Global Changes in Agriculture, and a producer panel on no-till corn production and effects on soil and water resources. Dakota West RC&D Coordinated the distribution of medical information packets purchased through the File of Life Foundation. The packet contains critical medical information enabling first responders to provide appropriate treatment in an emergency. The packets, held in a magnetized pouch designed to be placed on the refrigerator, contain an individuals name, medications taken and emergency contact numbers as well as other critical information. Project co-sponsors include: Rhame Quick Response, American West Real Estate, Bank of the West, Lake Agassiz RC&D, Adams County SCD, Stark County Emergency Manager, Mott Ambulance Service, West River Health Services, Southwest Healthcare Services, Dickinson Sheriff’s Office and Dakota West RC&D. 5,000 packets are being distributed through the initiative. Base One, a soil stabilizer, is a blend of silica's, surfactants, emulsions and satrants that, when mixed with water, will take clay and aggregate to form a hard surface for building roads. Cal and Julie Hoff, who farm north of Richardton, were interested in demonstrating the product’s effectiveness and practical use as an alternative to concrete for the heavy use areas in their feedlot. With assistance from Central Stark Soil Conservation District and Dakota West RC&D, the Hoff’s installed the product on a 15 by 400 foot area where he feeds. After the surface is prepared with the Base One and allowed to properly cure, an oil seal coat was applied and the surface was chip sealed. “We’re testing it to see if this produce is something that can save producers when their building a feedlot,” Cal said. The completed project cost less than one-third that of concrete and Cal believes the surface will be easier to repair over time. The project will be monitored by the Hoff’s and Central Stark Soil Conservation District and project tours are being considered. The City of Hettinger identified a need for additional housing units several years ago. A recent change in legislation allowed city housing authorities to use essential function bonds to construct housing. Hettinger formed a housing authority and bonded to build two four unit town-home structures in 2007. The units were completed the following year and were quickly occupied. As project coordinators contemplated landscaping designs, they determined there was an opportunity to demonstrate lower water use lawns and gardens for the semi-arid region. Water supply and costs are a concern in the area as are the environmental impacts of traditional irrigated landscapes. Project coordinators determined a xeriscape design would use less water and fertilizer while requiring fewer fossil fuels to construct and maintain the landscape. The project is also located within the Mirror Lake watershed and would indirectly improve the watershed quality. Most of the project was constructed in 2008 with final completion in 2009. The xeriscape design incorporates native plants, including the majority of the lawn planted to native grasses. Rain gardens have also been installed as well as a number of attractively placed native plantscapes. 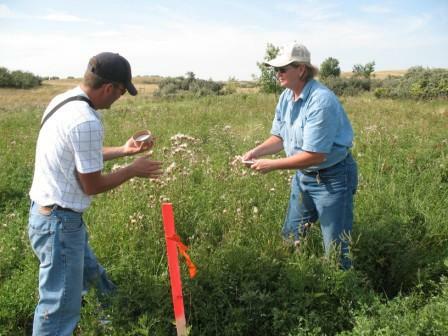 Project Assistance was provided by the Adams County Soil Conservation District, Hettinger Research Extension Center, Natural Resources Conservation Service and Dakota West RC&D. Project Coordinators Sherry Wick, Dan Nudell and Julie Kramlich encourage all Hettinger visitors to visit the project site.